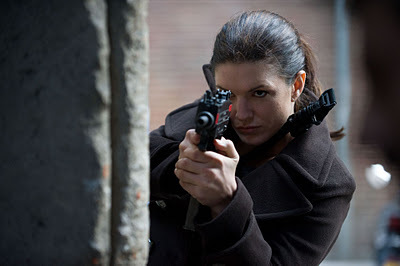 Gina Carano is a very atypical action heroine in Soderbergh’s ‘Haywire’. Standard spy-fi fare presented in a very atypical style, Haywire arrives in time to perk up a dull movie month. Written by Lem Dobbs (Kafka, The Limey) and directed with a boldly minimalist approach by Steven Soderbergh (still keen to play with every known movie genre and thankfully not yet making good on his threat of retiring), it’s a lightweight action-thriller in the sense that it’s the usual formula stripped down and streamlined in a way that reinvigorates a tired genre. It’s a by-the-numbers story: Mallory Kane (Mixed Martial Arts champ and former American Gladiator Gina Carano) is an agent for a private intelligence/security subcontractor (think Blackwater by way of the Jason Bourne franchise). After a routine operation in Barcelona, Mallory’s employer and ex-lover Kenneth (Ewan McGregor) persuades her to take a quick assignment in Dublin, where she’s to accompany an MI6 agent (Michael Fassbender) on a routine operation that is actually a set-up for Mallory’s termination. She’s been framed as a rogue agent and targeted for elimination, and naturally she wants to know why. To that end, Mallory dodges the police while relentlessly pursuing Kenneth and his shady clients Coblenz (Michael Douglas) and Rodrigo (Antonio Banderas). Much of the story unfolds in flashback before a climactic confrontation at the New Mexico home of Mallory’s father (Bill Paxton). Soderbergh has always had a knack for offbeat casting, and it serves him well here; Carano was an inspired — and risky — choice. The 29-year-old MMA fighter has appeared almost exclusively as herself on television and had one or two small parts in film and video games, and Haywire is her first leading role. Athletes rarely make good actors (Brian Bosworth in Stone Cold, Shaquille O’Neal in Steel, and Dennis Rodman in Double Team spring quickly to mind) and placing such an untested actor opposite such a talented veteran cast could have easily proven disastrous. Carano holds her own in terms of both acting and action chops. The few instances in which her delivery is awkward actually develop her character, such as when tomboyish Mallory has to serve as arm candy at a swank party. Carano performed most of her own stunts in the action scenes, leaping cars, scaling buildings, firing off a mini-arsenal of small arms, and kicking the hell out of plenty of bad guys. She manages to make Mallory believable as a woman both dangerous and vulnerable as she navigates a world were the only trustworthy men are the poor schmuck she ostensibly kidnaps in the first ten minutes and her ex-Marine daddy (and even he seems disturbed by her darker side). The real thrill of Haywire lies in its overall look and feel. Soderbergh, who also served as the movie’s cinematographer and editor, shoots Dobbs’ terse screenplay in a fast-paced fluid style with a ’70s sensibility. The photography has a natural look but still coded for each exotic locale — grey, overcast Dublin; warm, sunny Mexico; crisp, snow-blanketed upstate New York, etc. — accentuated with unconventional but not showy editing and a haunting jazz score by David Holmes. Like last year’s Hanna, it breathes a little art-house cool into a tired genre, but with wallowing in hipster excess. No small feat, that. Added to watch list, thanks mate for another great review.